What happened earlier today during the third trial of the fishworkers’ strike. SOURCE: http://asyntaxtostypos.wordpress.com/ post, published in athens indymedia. What happened today in the third trial of the fishworkers strike (the strike was brought anew to court). – The deception of some Egyptians who were misled to sign a labour agreement in Arabic and in Greek language, which was very different from the original English version [the valid one should disputed occur] which contained onerous labor terms*. – The fact that “employers unilaterally delegated to “representatives” of a “union of Michaniona fishworkers” (a union which excludes the overwhelming majority of Egyptian) to calculate the “share”, with no control whatsoever exerted by the workers themselves; thus, the trawlers bosses were in position of paying the fishworkers as little as they wished ” testified today on court by the defence witness Secretary of Thessaloniki Trade Unions Sotiris Zarianopoulos. – The fact that the trawlers owners refused to provide the fishworkers with copies of their individual employment contracts, which are necessary for them in order to renew their residence permits, with a view to have them deported and replace them with other, cheaper fishworkers. For these allegations, a witness for the prosecution said that the she either did not know of those facts or denied them, rousing a storm of protests by tens of strikers who were present in the court room and watched the process. Amid strong protests over allegations and arguments of the trawlers owners’ lawyer (who argued inter alia that “foreign workers shouldn’t be allowed to come here and establish unions at will …”), the procedure was halted until tomorrow for the strikers’ lawyer to produce the required documents. The trial was attended by the CP MP Sophia Kalantidou (who had submitted interpellations to the parliament on the issue), the Secretary of Thessaloniki Trade Unions Center Sotiris Zarianopoulos (PAME), the Deputy Secretary of the Thessaloniki Trade Unions Center , Despina Charalambides (Aftonomi Paremvasi –Radical Left Coalition), the President of the Thessaloniki Builders Union Vassilis Revas (PAME) (last Monday a press conference by the fishworkers and S. Zarianopoulos took place at the offices of the Trade Union of Thessaloniki) and several leftist and independent supporters of the struggle including the Soliodarity Assembly with the Fishworkers’ Strike. * The unacceptable “lost in translation” Greek text of ‘agreement’ which misled five (of a total 130) of Michaniona Egyptian fishworkers included the following condition in paragraph 6: “The Egyptian fishworkers should not be involved in any Greek political party or body related to labour obligations and rights “! This is a translation of a Forum of Migrants in Crete press release. 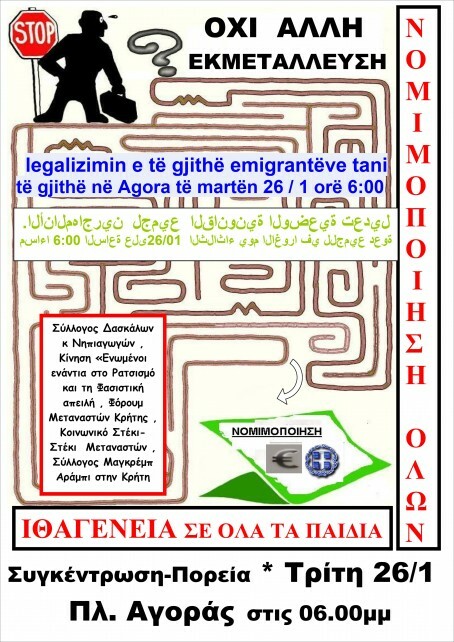 The Forum of Migrants in Crete considers that the proposed amendments to the Code of citizenship and the participation in elections of local government indeed are in the right direction – at any case we would be saying the same thing, even if it was about a single immigrant obtaining his/her rights. what about the children whose parents had been legally residing but were at some point unable to renew their residence permits (in most cases because they had not adequate work revenue stamps)? what about the children who have no parents (since many minors come on their own)? what about the children of parents without legal documents? Concerning the proposal for the participation of all long-term foreign residents in the local authority elections, we ask why the boll excludes them from being candidates for senior posts? We respond to xenophobic voices that they should not worry, since in any case the bill concerns to only a very small percentage of people from other countries, those who live lawfully and continuously for many years in Greece. As for the acquisition of Greek citizenship by first generation immigrants, we actually wait to see the concrete and final requirements of the bill; under the pressure of racist critics. though, we expect them to be harsch. We will continue to struggle for the legalization of all immigrants (the draft law does not say a single word about sans papiers, and legal documents is a prerequisite for everything proposed by the bill). We will continue to struggle for citizenship for all children born, live and grown-up in this place. We call for an info, discussion and recommendations event on Tuesday, January 26, 6:00 pm at Agora Sq. Chania. BRUSSELS, Jan 22 (IPS) – The number of asylum-seekers and other migrants expelled from the European Union in joint operations between its governments has grown three times in as many years, IPS has learned. At least 1,570 individuals were removed from the EU’s territory in 31 flights coordinated by the bloc’s external borders agency Frontex between Jan. 1 and Dec. 15 last year. This represented a tripling in joint expulsions – involving authorities from two or more EU states – since 2007. Some 428 migrants were flown out in such operations that year, with the figure rising to over 800 in 2008. The data – unpublished until now – indicates that Frontex has rapidly stepped up the pace of its activities in the four-and-a-half years since it was founded. And the involvement of the Warsaw-based agency in expelling people who have been denied permission to remain in the EU looks set to increase further. When the EU’s presidents and prime ministers met in Brussels in late October, they approved a plan to expand the work of Frontex. The European Commission, the EU’s executive arm, has been asked to come forward with proposals early this year to beef up the agency’s powers. The plan foresees that the agency will finance a greater number of chartered flights for expulsions and cooperate more closely with countries from which migrants trying to enter Europe originate. Organisations working with asylum-seekers are perturbed that Frontex is acquiring greater resources and responsibility without being required to demonstrate that fundamental human rights are safeguarded during its activities. A recent report by Human Rights Watch drew attention to how Frontex has helped the Italian authorities expel migrants to Libya, without giving them an opportunity to apply for asylum. In June last year, Frontex coordinated Operation Nautilus, in which a boat carrying an estimated 75 migrants was intercepted off the Italian coast. Using a German Puma helicopter, the operation was the first of its kind in which Frontex succeeded in forcing migrants from the central Mediterranean Sea back to Libya. Titled ‘Pushed Back, Pushed Around’, the Human Rights Watch report stated that Frontex was unable to give guarantees that Libya had allowed the migrants to apply for asylum. All individuals are entitled to seek asylum from persecution in a country other than their own under the United Nations’ 61- year-old Universal Declaration on Human Rights. Bill Frelick, a campaigner on asylum issues with Human Rights Watch, said he was concerned that Frontex is being given a bigger role in expulsions and that its future operations will needed to be carefully scrutinised. Bjarte Vandvik, director of the European Council for Refugees and Exile, a group defending the rights of asylum-seekers, said that whenever an individual is removed from the EU, the principle of “non-refoulement” must be respected. A key tenet of international refugee law, non-refoulement means that nobody should be sent to a country where he or she will be at risk of persecution. Philip Amaral, a policy officer with the Jesuit Refugee Service in Brussels, said that Frontex staff should be given proper training to ensure that asylum law is upheld in their operations and that the basic needs of migrants are met. After the first court decision that deemed last week the strike unlawful , the second trial’s decision came yesterday and was also against the strike. The strikers go on with their struggle with 24 hour strike decisions. Trawlers bosses also continue with their effort to bring other Egyptians as scabs. According to Rhizospastis newspaper, “agents” in Athens are into this, and a meeting took place in the trawler owners offices in Michaniona, between the bosses and an “agent” (referred as “smuggler” by the newspaper). The Egyptians themselves estimate that they will probably be in position to reach some agreement with their compatriots, should any of them be brought as scabs, since it is highly unlikely that the people allured would be aware of the situation. “If they attemt to bring scabs, instead of 250 strikers they will have 400”. This is one of the things some of the strikers shared with the attendance of the successful Info Event of Wednesday at the Thessaloniki Polytechnic. About seventy people were there. “The strikers talked in a way that both moved us and strenghtened our conviction that their fight is a fight for us all. With dignity and determination to go all the way with their struggle, they spoke warmly and directly. In other words, they “forced” everyone to stand beside them and try to put forward solidarity action on even more serious basis. Besides the ultimate goal, the victory of the strike, we can learn from them and get to know each other. We have to learn how to intervene (or even attempt to do so) on a sound basis, with a view to real links with the people in such struggles, and to the social and not simply the political. The strikers also talked about how they understand solidarity and made clear two things: they want to avoid at any case extreme conflicts between forces supporting the strike, as well as any action that could endanger their physical presence at the village. Under current conditions these seem reasonable and understandable. In other words, if one believes that this is the time to resolve disputes with the Communist Party, there is clearly a problem…”. 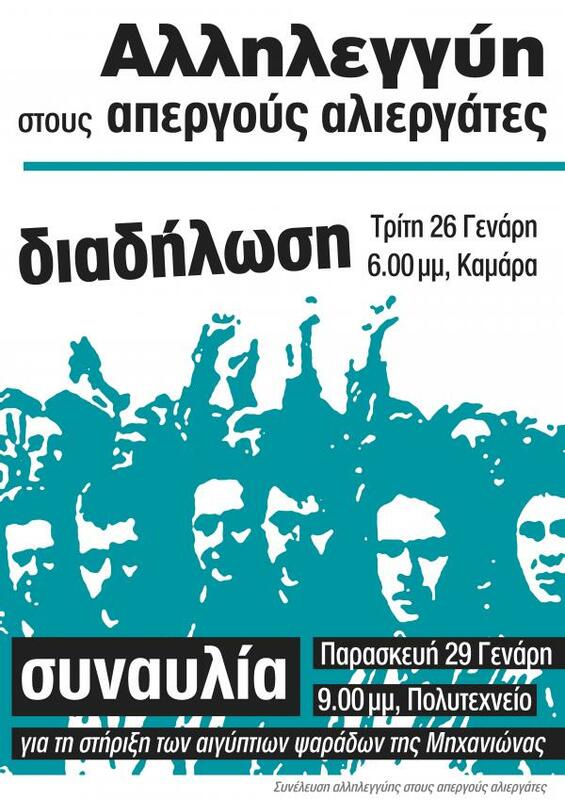 a solidarity concert on Friday, January 29 at Kamara square. Update on the Nea Michaniona fishworkers strike. The case of the employers against the strike of the fishworkers was brought anew to court yesterday. The fishworkers are now on strike under a decision of their own Union. The bosses want the court to decide an injunction against the strike, which means that for each day of the strike the Union and the fishworkers should compensate the owners for the damages. a) notification of the strike was not sent to the pertinent body; they now said that the employers’ body to which the strike was officialy made known to (the Greek Shipowners Union for Middle Fisheries – ΠΕΠΜΑ – is a nationwide body of owners who only deals with … European policies! The exact reverse of what they had claimed on the first trial, namely that this body – ΠΕΠΜΑ – was the one that the fishworkers should sent the notice for the strike to and not to the local Union of ship owners, as the strikers had done when they first declared a strike. The bosses twist things the way it suits them of course. b) Some of the strike’s requests, for instance the insurance fund under which they have to be covered for labor accidents and illnesses, is not the business of the ship-owners but of the pertinent government Ministry (of course it had been the ship owners who had lobbied at the Ministry and succeeded in making the unfavourable for the workers insurance fund tranfer). c) Above all, the bosses claimed, it is the Union of Nea Mihaniona Fishworkers the one legally assigned to be present at the fish auctions, weight the catches and calculate the workers’ share; they also claimed that the Egyptians were never obstructed from exerting partly control to the processes. This shows the central role of that yellow union for the ship owners. What the ship owners try to avoid at any cost is to recognize the collective, autonomous body of the Egyptian workers, and thus lose control, while on n the other hand, the key demand of the Egyptians is just that, that through their Union they have control of the weighting processes and the calculation of shares, since they the yellow union is of course not to be trusted. The strike does harm the ship-owners a lot: they lose millions. The Egyptians are determined to continue. The bosses, on the other hand, are probably ready to replace them with the help of the Egyptian embassy. The most important battle will be done if scabs come, from Egypt or elsewhere. In that case, there will be blood, since the Egyptians are really steadfast to their struggle. Whether we like it or not ΠΑΜΕ / the Communist Party is the only one with the power, the networks and the mechanism to support the battle in Mihaniona . Those of us who want to support the struggle and we are outside ΠΑΜΕ / the Communist Party we have to go and really see what we can do: see what small and practical things we can do, such as make the strike known in Thessaloniki, collect money etc. The court decision about the strike is to be issued tomorrow; the strike continues, tomorrow there is the info event at Thessaloniki Polytechnic.